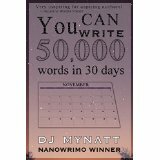 You Can Write 50,000 Words in 30 Days by DJ Mynatt is a great book for new writers and those who want to continue propelling forward in their writing careers. In the book, Ms. Mynatt tells of her personal journey in writing and her experiences in participating with NaNoWriMo. I loved the parts where she includes her blog entries while participating in NaNoWriMo because the genuineness of her words shows the real life adventures of a writer. I found the book informational, entertaining and encouraging and would absolutely recommend it. I received this book from the author in exchange for my honest opinion which I’ve provided here. Sharee, thank you for this awesome post and your kind words. Your support — and your words — are a blessing to me! God bless you!